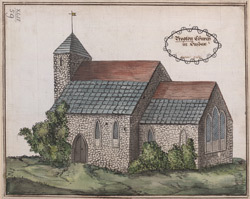 This is a south-east view of St Peter's church, which is situated on a slope near the village of Preston in Sussex. It was built of flint in the 13th century, in the Early English style, with a nave, a chancel and a slim west tower. Preston village is now part of Brighton.